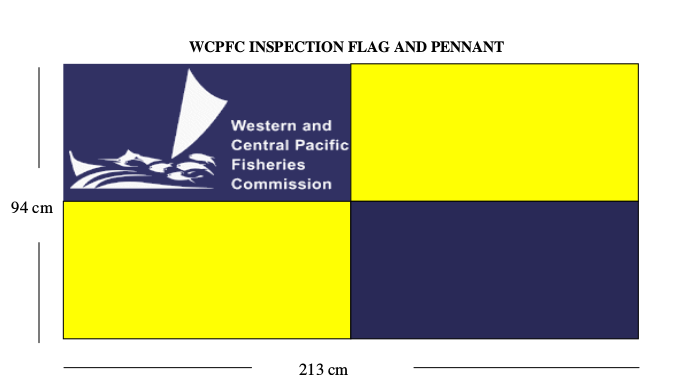 WCPFC3 adopted the Western and Central Pacific Fisheries Commission Boarding and Inspection Procedures ( 40.1 KB). 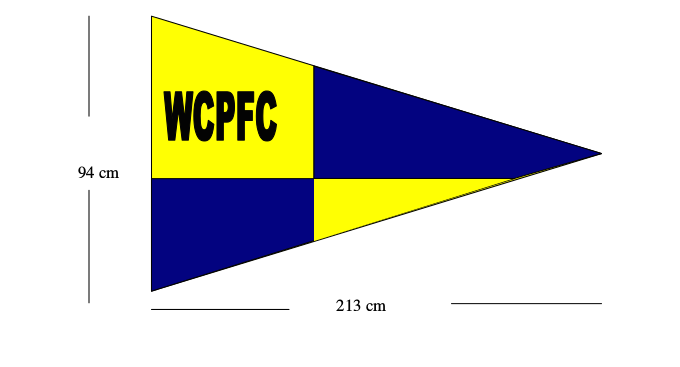 Paragraph 18 of the Procedures provides that “Authorized inspection vessels shall fly, in clearly visible fashion, the WCPFC inspection flag as designed by the Commission.”The below design was approved by WCPFC4. The intended use of the flag is for inspection vessels, and the pennant for boarding launches. The assigned number for an inspection vessel should be included in a contrasting colour to the lower right quadrant of the flag and upper right quadrant of the pennant. Paragraph 12 of the Procedures requires the Commission to “maintain a register of all authorized inspection vessels and authorities or inspectors” (the WCPFC High Seas Boarding and Inspection Register). This paragraph also stipulates that, “only vessels and authorities or inspectors listed on the Commission’s Register are authorized under the Procedures to board and inspect foreign flagged fishing vessels on the high seas within the Convention Area”. In respect of the Register, WCPFC3 agreed that “boarding and inspection operations pursuant to the Procedures would be authorized to begin 60 days after the circulation to CCMs by the Executive Director of the register of authorized inspection vessels in accordance with paragraph 17 of the Procedures” (para.155 of the WCPFC3 Summary Report). (b)with respect to inspectors they assign pursuant to the procedures, provide the names of the authorities responsible for boarding and inspection. To promote effective high seas boarding and inspection, there is a need for all CCMs that have authorized their fishing vessels to fish in the WCPFC Convention Area beyond areas of national jurisdiction, to provide to the WCPFC Secretariat for circulation the name and contact of their respective “Authorities”. This will ensure that should their vessels be boarded, there is a listed “Authority” for the boarding CCM to contact. Paragraph 21 of the Procedures provides that: “In carrying out boarding and inspection pursuant to these procedures, the authorized inspection vessel and authorized inspectors shall make their best efforts to communicate with the master of the fishing vessels in a language that the master can understand. If necessary to facilitate communications between the inspectors and the master of the vessel, the inspectors shall use the relevant part of the standardized multilanguage questionnaire to be prepared by the Secretariat and circulated to all Contracting Parties with authorized inspection vessels.” CCMs have responsibility for translating the questionnaire into their language(s) used by their vessels so that it is accessible by Members conducting inspections. Members have been encouraged to transmit to the WCPFC Secretariat for compiling and posting on the WCPFC website samples of their respective inspection personnel identity cards. If you subscribe to the WCPFC public newsletter, we will keep you up to date by sending you newsletters.